I'm not really a cocktail guy. The concoctions I spend time and energy optimizing are pure whisky plays: the Old Fashioned and the Manhattan. I want to taste the whisky. Indeed, the only cocktail I've ever blogged here was a banana infused bourbon Old Fashioned. But there are plenty of other things to do with whisky. For me, it's often about pairing. 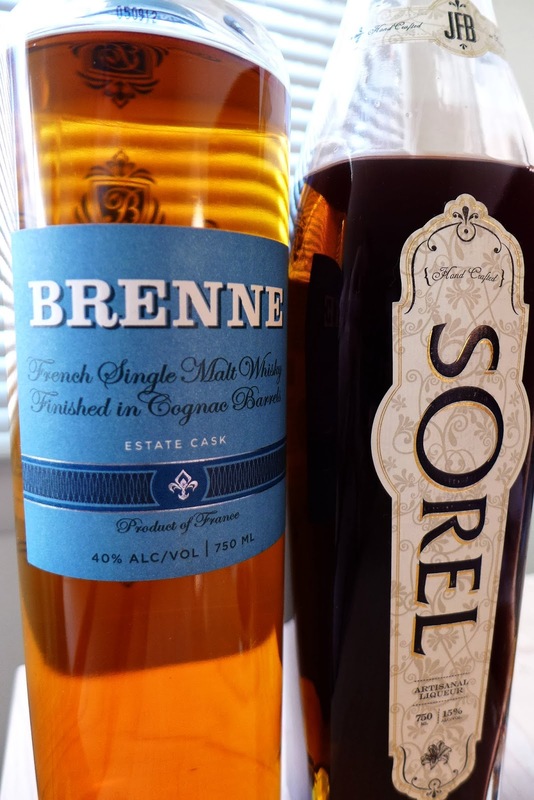 Sorel and Brenne is far simpler a drink than even the basic Old Fashioned. It isn't really a cocktail at all. It's a pairing. 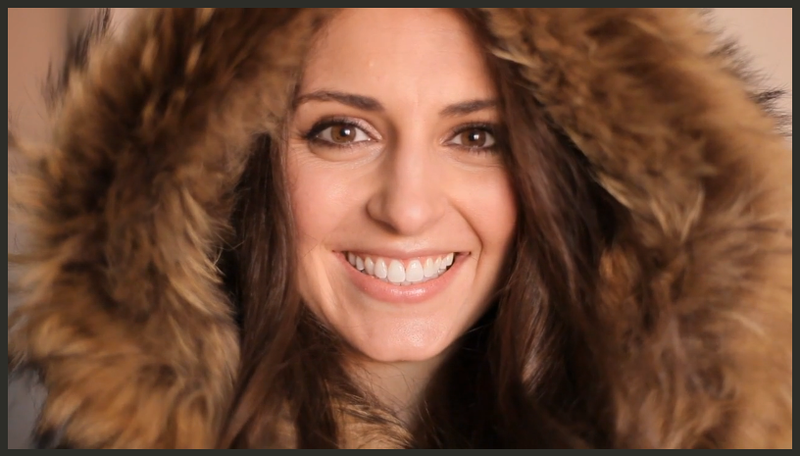 2/3 Brenne to 1/3 Sorel. And it's genius. I first had it at a party celebrating Brenne's first anniversary as a brand last autumn at the West Village bar "Bell Book And Candle". Allison Patel, Brenne's creator, had invited friends and people who helped get Brenne off the ground to have a birthday cake and some drinks. I was honored to be on her list. It was a stellar party. There I met Jackie Summers, the creator of Sorel. I already had a bottle of Sorel and had been following @jackfrombkln on Twitter. I was excited to meet him because I knew how much Allison liked him, but I wasn't prepared for how heartfelt, genuine, warm and sweet he is. He's not just a nice guy, as it turns out, but someone aggresively on the path of wisdom about life (read on). Someone mentioned the pairing of Brenne and Sorel and I tried it and played with it a bit and I really enjoyed it. I had been looking for an application for that bottle of Sorel. From Right: Sorel, Brenne, and the pairing, which is called "The Last Call". Brenne: (I'm drinking the ethereal and apricot-banana floral cask 257 today - and it makes sense to pay attention to cask number as the variations are fascinating) is delicate, estery fruity floral pretty thing - soft and easy with silky mouth filling lignans from new French oak. It comes off as sweet, but not from actual sugars, but solely the cues of esters and lignans. It's so creamy. Sorel (which Jackie Summers, it's creator, pronounces "sew-REHL" like it was a girl's name; instead of like the tart herb "sorrel" which most people tend to do while reading it) is a lightly alcoholic tincture of hibiscus flowers and a mess of baking spices (clove, nutmeg, and cinnamon). I say "tincture" because it doesn't drink like a liqueur: it isn't too sweet and there's no syrupy sugar texture here. Sorel is low proof (15%) but high flavor: bringing its fascinatingly intense, almost medicinal mix of lushly perfumed dark red fruit with aspects of tart sweet rubarb and red currants with those spices nutmeg, cinnamon and cloves to a light and smooth texture with a bit of ginger heat. Over a few sips that hibiscus floral intensity spice combo builds up and become intense. This is made to mix. But when these two mix at the magic proportion of 2 parts Brenne (or perhaps a smidgen more) to 1 part Sorel and allowed to rest and integrate for 15 minutes or so something magic happens. The color is a russet scarlet mauve. The nose becomes malt whisky loaded with cinnamon red hots, baskets of roses, and jammy red vinous scents, like a sherry bomb Scotch but with a fruity floral roobios zing while smoking a clove bidi. The palate of the combo emphasizes the odd and unexpected planes of their union: floral and sweet without being sugared. The sweetness is a mass of heavy massed tropical floral notes and tons of zing (stealth ginger). The spices - the cloves, mace, and cinnamon - ride around in a big car made of malt whisky stone fruits made zingy - like raspberry. Tasting it you'd never guess there were only two ingredients. It likes some water - or even better - some ice. This has joined my regular rotation. It puts a vinous overlay over the whisky in a way that reminds me of a Manhattan, but with a totally new and very Caribbean flavor set. This pairing has come to named "The Last Call". It's a drink with a future. It also likes a few drops of orange water or citrus bitters - but my favorite is neat, 2/3 plus a drop of Brenne and slightly less than 1/3 Sorel. Just magic. By the way, visually, something cloudy happens to the spirits in combination. Although both are totally clear on their own, mottled flavor elements become visibly flocked out. But adding water disperses them again. flocculating flavor compounds until water is added. The synergy here is pretty cool - but it's actually a much bigger coincidence than it appears. These are both spirits whose story is hard to tell without telling the stories of their compelling creators. Jackie Summers (Sorel) and Allison Patel (Brenne) are good friends. They live in the same town and have become stars at the same time for being independent entrepreneurs introducing their own liquor brands. Both are beautiful and charismatic people who light up a room. Both are thinkers and independent bloggers before introducing their brands. The fact that they are on this parallel course and are buddies is cool. But it's no reason for their drinks to mix well together. I mean, what are the odds? Jackie was adapting a traditional Caribbean herbal cure into a liqueur. Allison had discovered an indigenous French malt whisky in search of bottling strategy, a brand, market, and leader. Nothing in these two histories suggests they should work (except the fact that they both seem to mix pretty well generally). And, of course, he does this little Sorel thing in his spare time - actually making the stuff and also making it rain. 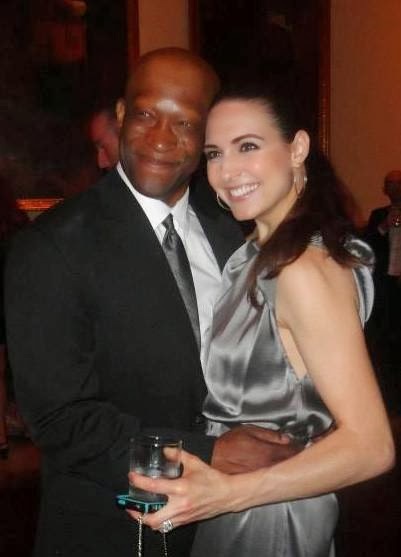 Today, I asked Jackie if he had a picture of he and Allison for this post. He produced the one below and then added: "Allison is my sister in alcohol". 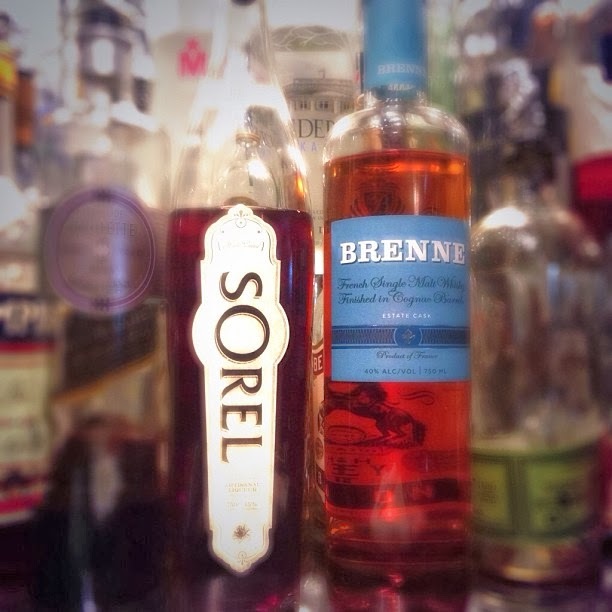 Try a Brenne and Sorel. It's like having everything hip about New York in a glass. While you're at it, think up a name for this simple pairing. Good buddies that mix well together. (All the liquors tasted in this piece are my own bottles. 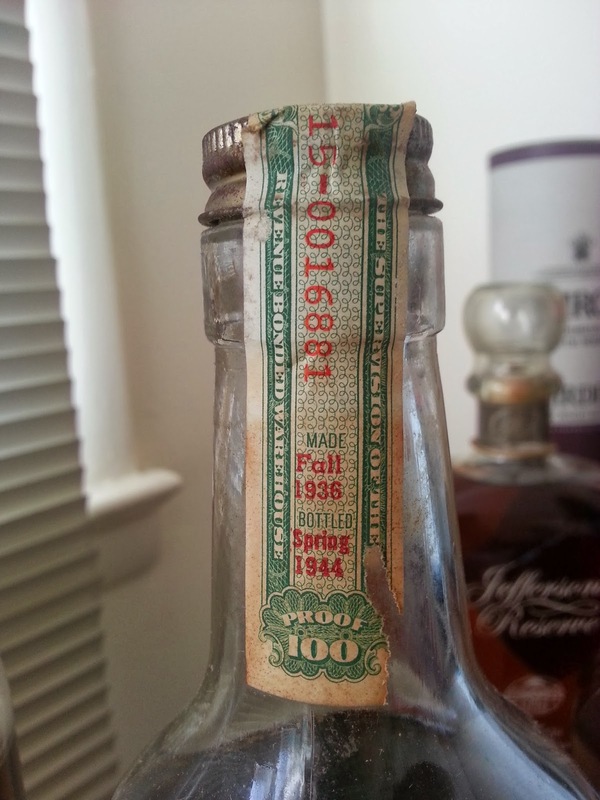 Sorel purchased at Dry Dock in Red Hook from Brandy Rounds. 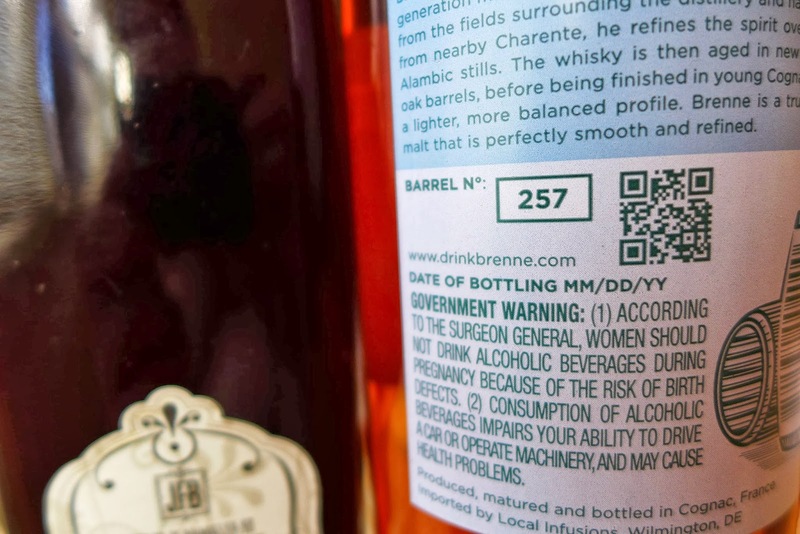 Brenne purchased at Park Avenue Liquors from Marlon Paltoo). 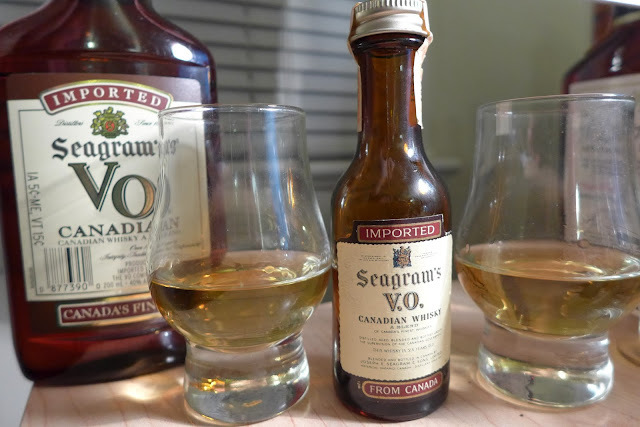 Seagram's VO Canadian Blended Rye Whisky from 1971 head to head against the current stuff. 1) V.O. 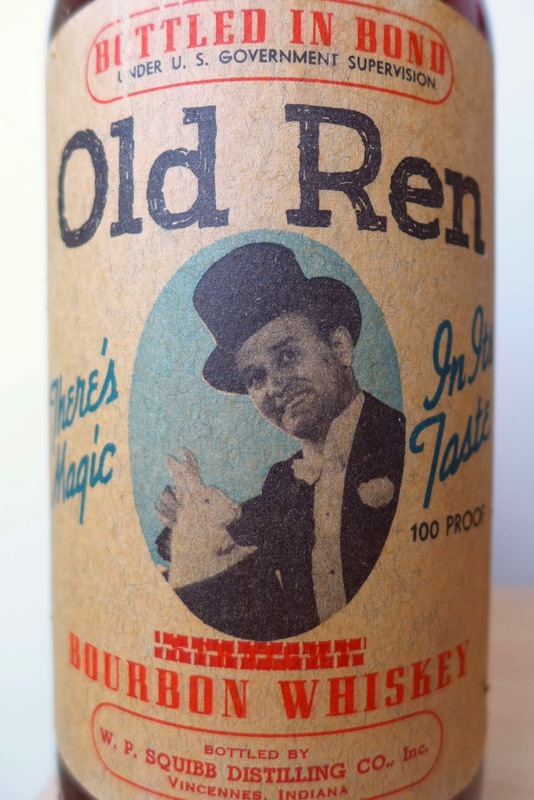 stands for "Very Own" - because it was a special blend crafted for Thomas' "Very Own". 2) V.O. stands for "Very Old" and was an attempt to reference Cognac's V.S. designation. I won't bother to speculate either except to note that V.O. is always given with periods on bottle shots and ads from Repeal through the 1980s. Yet the current bottling and recent ads omit the periods. When, exactly this happened, and why, I have no idea. 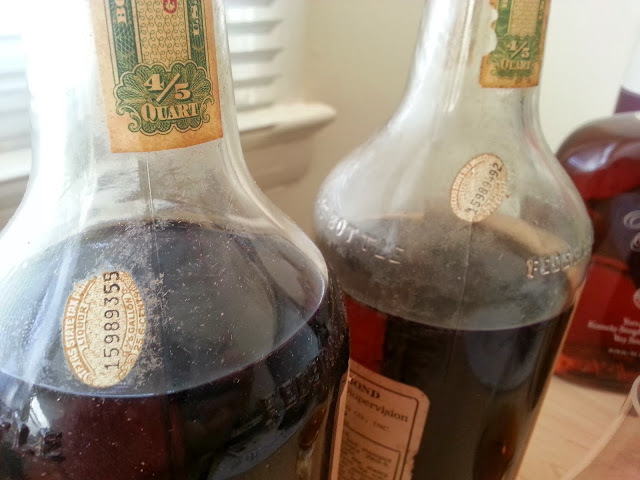 I use periods or not depending on which era's bottling I'm discussing. Early (probably 1920s) 2oz. mini bottle lacks age statement but does specify "pure rye". Is this mini bottle real evidence that V.O. once was a "Pure Rye" instead of a blend? Probably not. In any case, the provenance is unknown. It may be a fake. It may be an error. Or it may truly be a significant varient. It poses more questions than it answers. 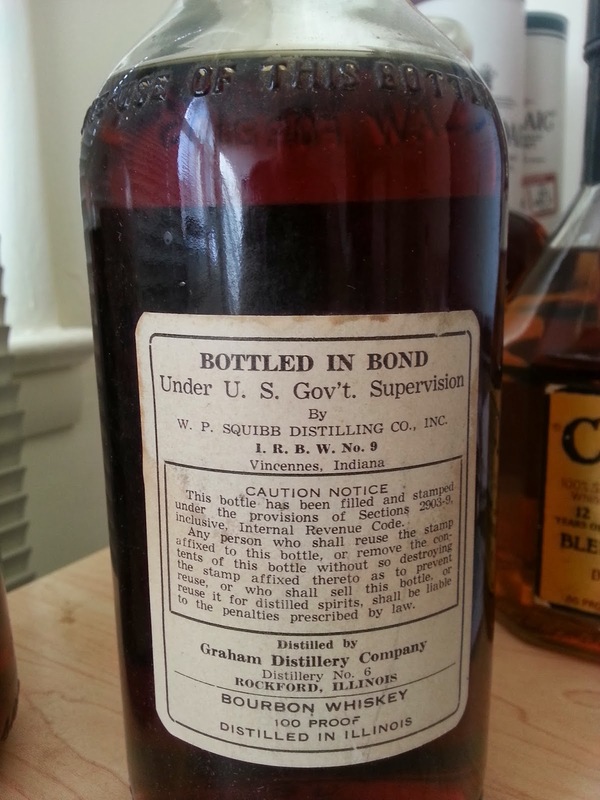 This 1928 full bottle specifies "Blended"
This 1936 ad shows the 20s-30s bottle style and specifies 86.8 proof. and the 86.8 proof strength statement. 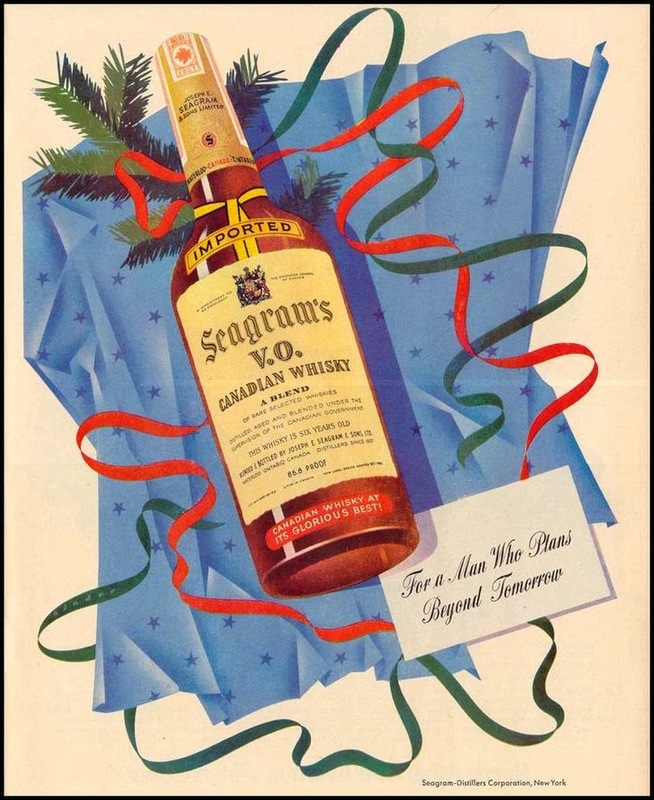 In this 1944 ad we see a 7 year age statement, both in the ad's text and on the bottle. But by 1946, a scant two years later it's back to 6 years again. Apparently for good. 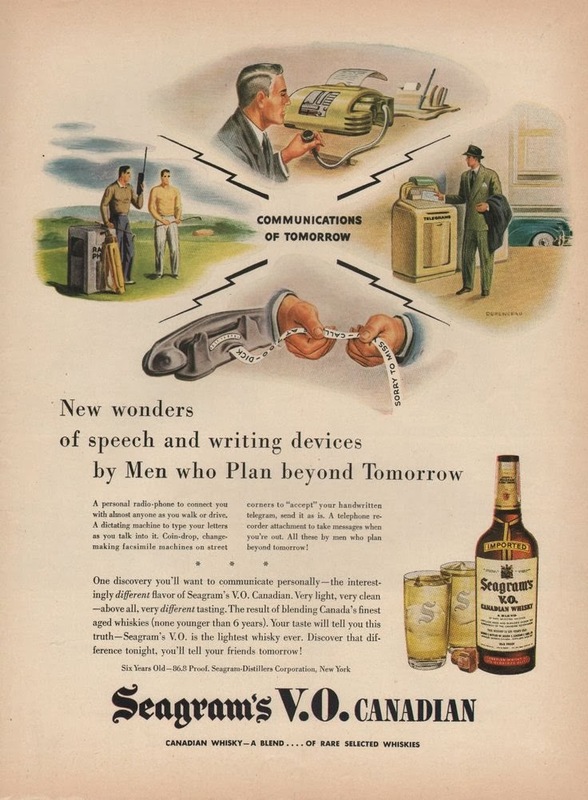 That 1946 ad is a wonderful bit of nostalgia today. The Sci-Fi "New wonders of speech and writing devices by Men who Plan beyond Tomorrow" include two refinements to telegram technology: a phone that spits out telegrams (at bottom) and a curbside telegram machines (at right). At left there are some very forward looking radio phones that presaged cell phones. At top we have a typing dictation machine. While the likes of Dragon Naturally Speaking and Siri have made this a reality, it's still in its infancy, so this particular item was quite forward thinking indeed. One thing is for sure, Seagram's V.O. 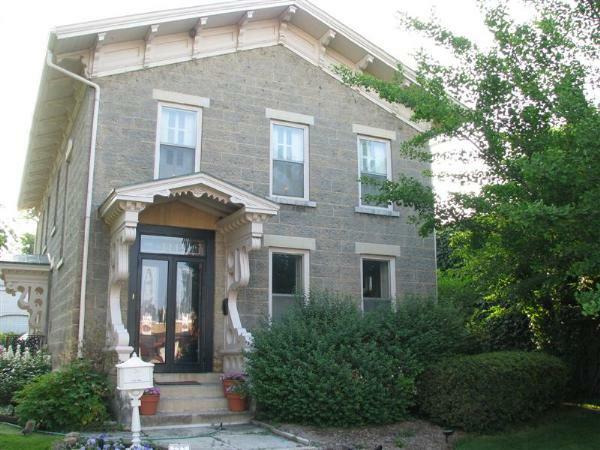 was very popular through Repeal and WWII and on through the Mad Men era. Why was it so popular? 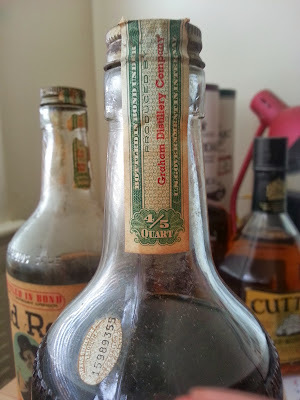 Probably for many of the same reasons rye whisky in general had been popular from Colonial days on: the herbal spicy flavor tastes like whisky to a ton of people. V.O. brought the Canadian refinements of smoothness, sweetness, and consistency through the particularly advanced Canadian art of blending and extensive use of refill casks. This gives V.O. a light and smooth aspect that appeals to a lot of people. V.O. is the jewel in the crown for Seagram's Corporation on through this whole long period. A titan. 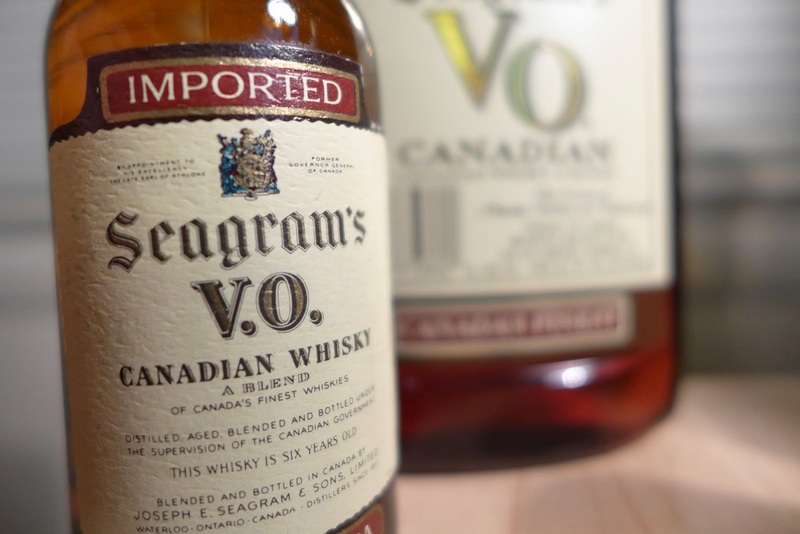 Seagrams, under Sam Bronfman, moved production of V.O. from Waterloo to Amherstberg, Ontario in the mid 1940s. In the late 1960s a more modern distillery was built at Gimli and production was moved there. 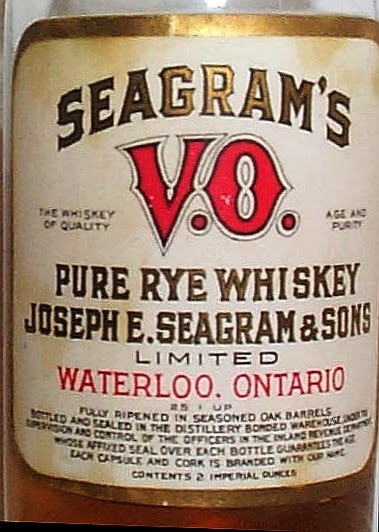 When Diageo took over in 2001 they shifted the bulk of VO's production to Valleyfield. 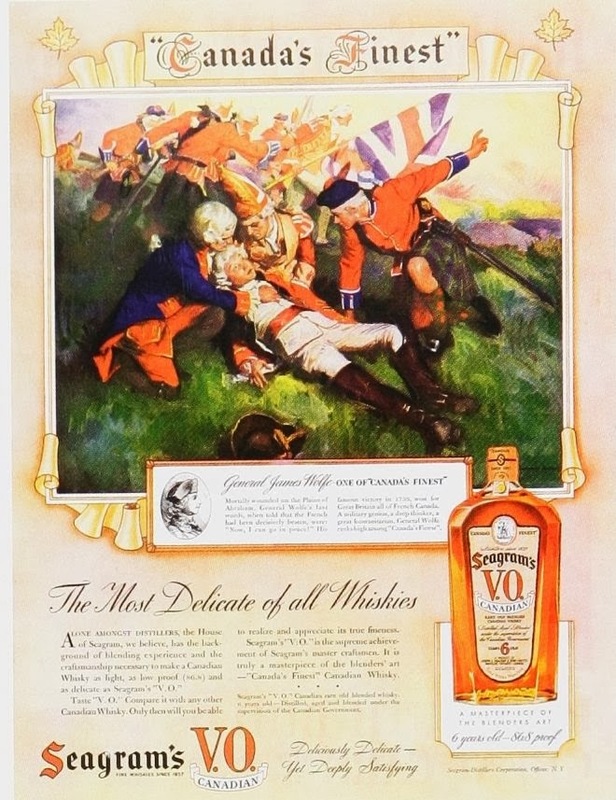 But, as VO is a blend of multiple whiskies, exact distillery provenance is difficult to pin down. Parts of VO still come from Gimli. And in the 60s, parts of V.O. may have still came from Waterloo. For this tasting I have sourced a 200ml flask of current production Seagrams VO from a train station liquor store nearby. 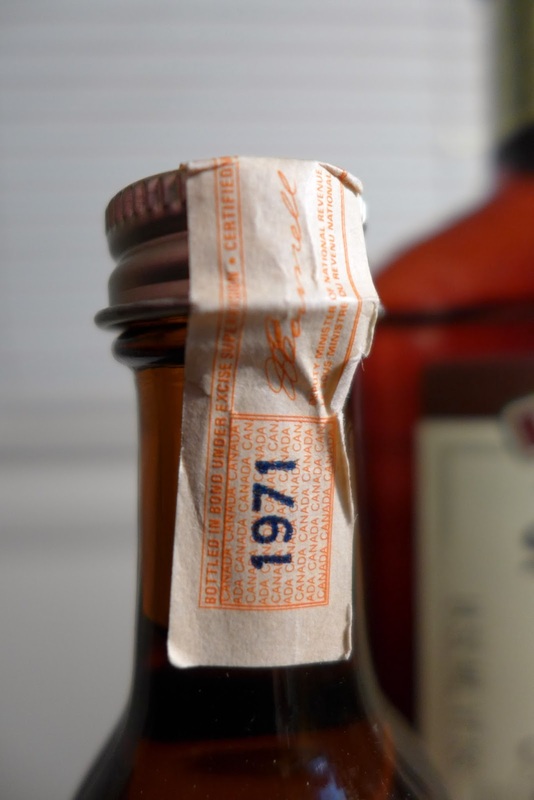 To give insight into the pre-Gimli flavors, a 1971 tax stamped airline bottle was sourced from a German auction house. No visible age statement. Base whiskies distilled at Valleyfield. Some flavoring whiskies may still come from Gimli. Nose: Creamy white vanilla fudge, mineral dust, some gentle cedar forest aromas, and grapefruit pith. Palate: Creamy and sweet on opening. The vanilla fudge sweetness is here, but gives way to rye spice and herbal and mineral notes along with rye heat and spirit heat on the expansion. The spirit heat moment at the mid-palate is why VO is typically used as a mixer - but frankly this sips quite nicely as a Canadian blend with all the classic aspects of the Canadian whisky flavor signature. The turn to the finish is asserts a slight astringency and ushers in the flavors of grapefruit peel pith that wax sweet and creamy again in the moderately short finish. It's surprisingly sippable for the price. On the whole, I was impressed. I was expecting a 2 star mixer but on the balance I'd say it's a 3 star entry level sipper. 6 years old. The tax strip says 1971 which is the year of distillation. Amherstberg, with some components perhaps coming from Waterloo, Ontario. No proof statement on the bottle. Also, interestingly, no volume statement either. Nose: Sharper, with a clear sweet vanilla floral opening. Deeper there are notes of fruity bitter hops and classic herbal rye sweet and spice notes. The extra proof is readily apparent in the nose too: spirit burn. Palate: The entry is sweet, with cream and cereal sugars, but is much drier than the vanilla fudge opening in the current version. Rye shows up as floral herbal flavors of rye grain and, cilantro and cut ivy. Herbal rye with some real intensity and chili scented spicy kick are all over the mid-palate too, which carries some of the effervescent mouth feel you get with pure rye whiskies. There is the hops-like bitterness of rye's turn melding into the fruity bitter grapefruit pith flavor note. The bitterness hangs on with sharpness and vividness through the rather long finish. This is a different animal; one much closer to a high end rye whisky. The flavors are vivid. Well delineated and embedded in a matrix of rye and corn that balance sweetness and dryness. 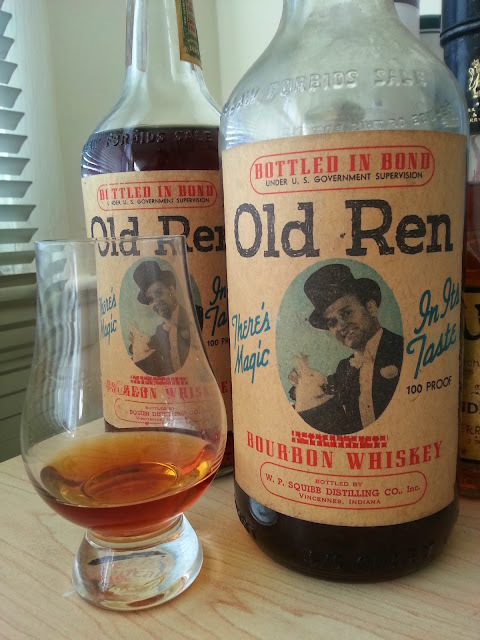 The main rap is that it's hot - but that's tot unusual for good rye whiskies.. But this is clearly a sipper and pretty nice one. 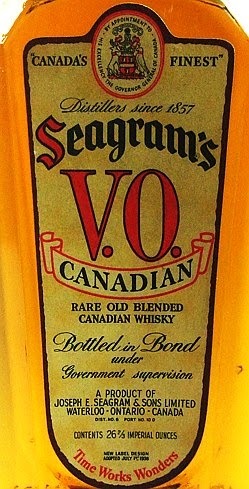 Seagram's V.O. 1973 ad. - an elegant bit of 70s design. sexual aggressor in the apres-ski which is all about highballs. Notice that she also has a much larger drink than he does too. So what can we conclude? The older version is better. Why? There are several obvious factors: now, the age statement is gone allowing younger whiskies to be used; the proof has been lowered from 86.8 to 80 (pretty close to 10%). Bottle maturation may be making an appearance improving the sweetness and intensity of flavors in the 1971 bottling (which has 42 years in the glass). And, of course, the distillery was changed not once but twice between the two samples. There are too many factors changing and not enough data points here to draw any conclusions. 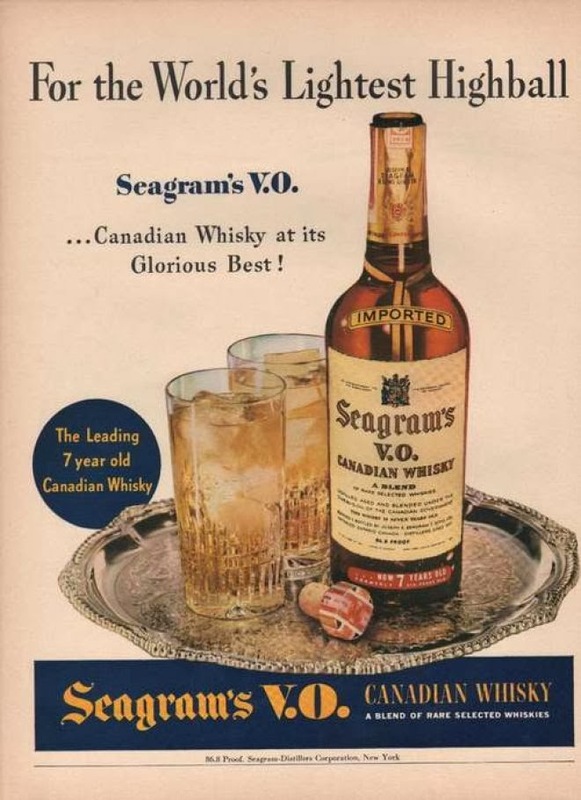 Except this one: Seagram's V.O. was a popular whisky for years because it was a pleasurable flavor signature that people drank neat, with water, ice, and in cocktails. With the reduction in quality VO mainly plays in mixer-land, but it still retains a big chunk of what once made it a titan. It's one of those whiskies you can enjoy neat that you can acquire at an attractive price point ($15 for a 750ml bottle). The kind you're likely to find at selection-challenged lesser bars where you want to get a whisky. I recommend having a taste and you may find it joins your arsenal of "basic options". I was certainly pleasantly surprised with both the interesting dusty mini but also the "plain Jane" new stuff too. .
CNN: "James Bond may want to reconsider his drinking habits, a new study says"
Tongue in cheek and serious at the same time, the article was prompted by an actual academic paper published in the British Medical Journal written by a trio of medical researchers where they tallied up the drinking in Fleming's novels and concluded that James Bond ought to be dead. Just from drinking that is. "It sounds like a mixed message: Drinking alcohol may offer some health benefits, especially for your heart. On the other hand, alcohol may increase your risk of health problems and damage your heart. So which is it? When it comes to drinking alcohol, the key is doing so only in moderation." Today's guest blogger on The Coopered Tot is health writer Claire Gilbert who has taken the time to make a well supported argument for why moderate drinking is good for you. This is hardly news - but it bears repeating, particularly in light of the more frequent press about how alcohol can kill you. Make no mistake - the key here is moderate drinking. When taken to excess no one is going to dispute that alcohol in any form can increase the risk of damage to your liver and nervous system. Drinking heavily can also raise your blood pressure, which can cause damage to the blood vessels, increasing the likelihood of heart disease. This habit can equally place you at risk of certain cancers and is also tough on your digestive system. Your immune system doesn’t escape either, as heavy drinking suppresses your immune function so your white blood cells are less likely to fight off infections, which you may be at greater risk of contracting any way if the impact on your decision-making means you take part in more risky activities that leaves you vulnerable to contracting sexually transmitted diseases. However, with your altered judgement this may not be the only thing that you regret, as drinking to excess also makes you more likely to have an accident – particularly if you get behind a wheel – or to get in trouble with the law. However, none of these situations are inevitable when you drink alcohol, as the key is how much you drink. If you’re able to moderate your intake, sensible drinking won’t lead to these problems and you’ll gain a range of benefits from doing so. Asked which alcohol if any is good for you and most people will say red wine. However, while red wine has been shown to be advantageous for heart health, any form of alcohol can be beneficial for your circulation and other parts of your body. That means if you prefer whiskey or brandy to wine, you can still reap the benefits of drinking sensibly over the week. Drinking from middle age onward, when the risks of developing heart disease begin to increase, can protect your heart and blood vessels in a number of ways. Firstly, moderate consumption of alcohol increases the production of HDL cholesterol, the form that carries cholesterol away from the arteries to the liver for removal from the body, which helps to retain a healthy blood flow through the arteries. Then there is the fact that drinking moderately reduces the production of fibrinogen, one of the proteins that promote blood clot formation, thereby decreasing the likelihood of a blockage in one of the blood vessels. Levels of inflammation in the body, insulin resistance (where the body struggles to lower blood sugars) and triglycerides (another type of blood fat) – all risk factors for cardiovascular disease – are also reduced. A number of other chronic health problems appear to be reduced when you drink sensibly. For instance, one or two alcoholic drinks daily have been found to reduce your risk of diabetes by around 30%, while no benefit was seen in people who don’t drink any alcohol. Similarly, around a measure and a half of spirit each day may help to reduce your likelihood of gallstones by about a third. Far from being detrimental to your mental function, drinking moderate amounts of alcohol has also been shown to protect against dementia. Looking beyond your cognitive function, drinking alcohol may help to promote other aspects of your mental well-being, as it has the ability to lift your mood and reduce stress when taken in measured amounts. What’s more, social benefits gained from drinking with friends, family and co-workers can further help to boost your mental health. With all this talk of moderate drinking, what does that actually mean? Based on the Dietary Guidelines for Americans this translates as up to one alcoholic beverage daily for women and up to two for men. As far as spirits go this is equivalent to 1.5 fluid ounce shot, but if you also like a tipple of something else, for beer, lager and cider this means 12 fluid ounces and for wine 5 fluid ounces. Follow these guidelines and you’ll enjoy more than just a good drink, but good health into the bargain. Laphroaig's Younger OBs considered. Cigarette? Laphroaig is the biggest selling Islay single malt according to Bloomberg (accounting for about 44% of the sales of all the whisky from Islay (!)) and it's not a big mystery why. It is tremendously smoky and peaty, maritime briney, and yet has beguiling stone fruit flavors and plenty of malty sweetness. The 10 year old expression is fierce, and yet well balanced, and at around $40 one of the biggest values in the single malt world in the flavor density for the dollar equation. I encountered it, like a lot of malt whiskey fans, very very early. 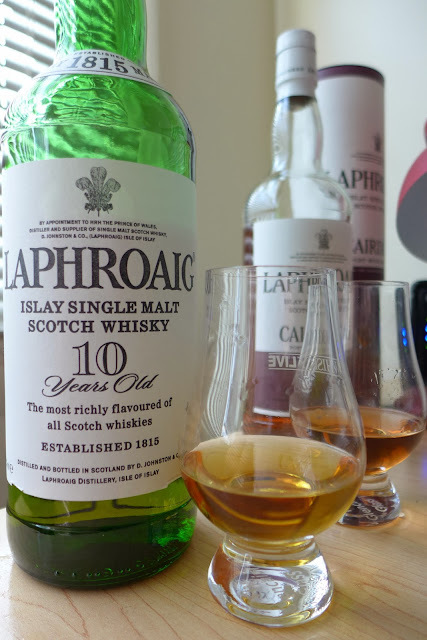 In the early 1990s after I had tried Macallan, Glenfiddich, and began tasting the Diageo Classic malts I immediately gravitated towards the compellingly simple and classic label of Laphroaig 10. You can't begin to explore the world of Scotch Whisky without being either seduced or repelled by Islay - the Hebredian jewel where history, mystery, and peat and sea air come together in a magical array of malt whiskies. Islay malts all tend to have a maritime influence and most have some peat (even if just by cross contamination) - or a lot of peat. Laphroaig sets an immediate benchmark and it says it right on the label of the base 10 year old expression: "The most richly flavored of all spirits". 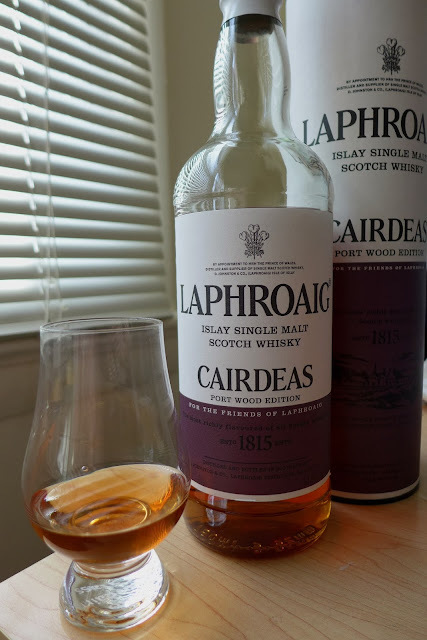 Older Laphroaigs (the 15, which was the flagship OB until 2009 when it was replaced with the 18) are more estery and have a more elegant and polite peat flavor profile. The younger ones have a forceful peat that is a polarizing flavor. Some folks absolutely love it and some folks totally hate it. The flavors of the peat are less about the smoldering earth, wet hemp, or raging wood fire like you get in other Islay malts. Instead there's a very special almost spicy aspect to the peat's flavor. And it was this aspect, I confess, that led me to steer clear of Laphroaigs generally for years. What the heck is that flavor note? I tend to describe it as a wet tobacco quality - like a cigarette that the rain put out and which you are now lighting up again. It's a flavor note that I pretty much only get in young (NAS through 10 year old) Laphroaig. But that's a whole lot of expressions in their line. Recently I decided to tour through these expressions to reassess how I feel about the flavors of younger Laphroaig. Disclosure of the origin of the samples tasted: the bottle of Laphroaig Cask Strength 3rd edition, and samples of Triple Wood 2012 and Cairdeas 2012 were generously provided by Ryan of JSH&A Public Relations in November of 2012 (over a year ago!). The bottles of Laphroaig 10, and Cairdeas 2013 are my own property, purchased at Park Avenue Liquors. Nose: Putty, clay, lime, hemp. Far beneath: distant melon, stone fruits, flowers and honey. Palate entry is sweetness instantly eclipsed by dark oily peat burn with tobacco and tobacco ash. Spicy heat and some meaty notes (salami) on the expansion and a long slow fade to ash and dirty malt glow on the finish. Big rich big dark Islay flavor. You'll either love it or you'll hate it. With a few drops of water, there's more putty on the nose although the melon and floral notes (distant to start) seem to disappear. There is more lemon citrus and sunny sweet on the palate. Mouth feel is a bit richer too. I'd say a few drops and 10-15 minutes of integration should be considered mandatory. An absolute landmark for value in an entry level single malt Scotch whisky. This is an iconic flavor profile. That said, I'm not in love with it personally. The peat comes off as dirtier than I'd like. I find the unadorned Laphroaig flavor profile not as satisfying as the varieties that gussy it up with some sweetness via some kind of wine finish. I feel almost guilty saying so. It's like saying you wish Jimmy Durante had a smaller nose. Color: Light amber with coppery and golden tints. Looks like a young bourbon. Nose: Honeyed quince, apricot, roobios herbal tea, and window putty are the dominant notes. But the aroma is both big and subtle: Creosote and heather, cardboard and floral meadow. Fresh unlit Virginia tobacco leaf and river clay. 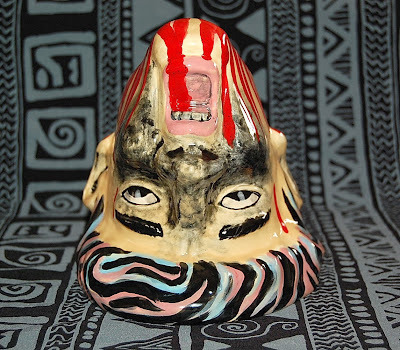 A harmonious tottering of extreme contradictions of loveliness and ugliness. Explosive on entry and huge on the palate. Honeyed and stone fruit preserves sugar sweet melded from the first instant with a fierce radiant lit tobacco smoky-bitter peat with a kiss of library paste. At mid-palate the expansion brings in stone and red fruits under the dusky thick smoke reek with covers all from first sweet piercing sip through the long aching ashy smoky finish. At the turn there are sub rosa fruity notes yield to tar and ashes. Adding a few drops of water adds some hints of stone fruit (nectarine) and whisks of floral perfume to the nose. These meld to clay and putty to form a classic Laphroaig peaty sweet aroma. The water thins the palate, gentles the sharp sugars of the opening adds a bit of thickness and honey to the mouth feel, and amps up the already generous spicy heat, but it shelves down the tar and ash in the balance. More citrus tang and ocean air joins the fierce peat reek and yields a more approachable, more harmonious dram. Slightly. Water is recommended but it drinks just fine neat too. This is a seriously fierce and peaty monster. A flavor packed dram for the money. I can see why so many people are wild for this one. A really delicious example of an Islay Peat Monster. I've had the opportunity to try other batches (the current one is 5). They are all good - Batch 5 perhaps best of all. Each Càirdeas Origin bottling has been crafted with whisky from the very first Laphroaig Càirdeas barrel, ranging in age from 13 to 21 years and boasting notes of white pepper and purple heather. This full-bodied whisky has been blended with equal parts of exceptionally unique whisky, intensely matured in small quarter casks for seven years. Laphroaig Càirdeas produces an extraordinary blend of hazelnut and earthy notes befitting of the 18th milestone. Nose: Gentle tobacco, earth, sweet grassy heather, meaty animal sweat, and a hint of stone fruit. Sweet with the sharp pointed grassy malt sweet of a young Islay like Octomore, or Ardbeg 10. The rich earthy tobacco burn of Laphroiag's characteristic peat attack comes on immediately. There's juicy sweetness in the mid-palate with tastes of Sauternes, white sultanas, and fruit gums mixing among the ashy tobacco smolder meets anthracite peat reek burn. It's a simple gastronomic trick, but I'm seduced. A few drops of water increase both the apparent sweetness and the considerable peat heat. The mouth feel richens a tad too. It's almost a wash.
almost 5 stars. A delicious peat monster with some elegance and finesse. Laphroaig® Triple Wood (96 proof) is the result of a distinct triple maturation process in American Oak ex-Bourbon barrels, 19th Century style quarter casks and specially selected European Oak Olorso sherry casks. The finish reveals the perfect marriage of peat, oak and sherry notes. Roughly 12,000 bottles have been produced for the U.S. market and will be available at participating retail locations beginning in October 2012. Nose: Virginia tobacco, earthy clay, distant stone fruit, a farm animal's haunch, fresh sawn lumber. The palate entry and bloom are dominated by lumber with some kiln dried "craft whisky" barrel flavors and tobacco and gentle malty sweet. With some air and time cherry candy notes play underneath. The interplay of fruity sweet with hot, darkly bitter peat is lovely. borderline four stars. This was my least favorite of the group. 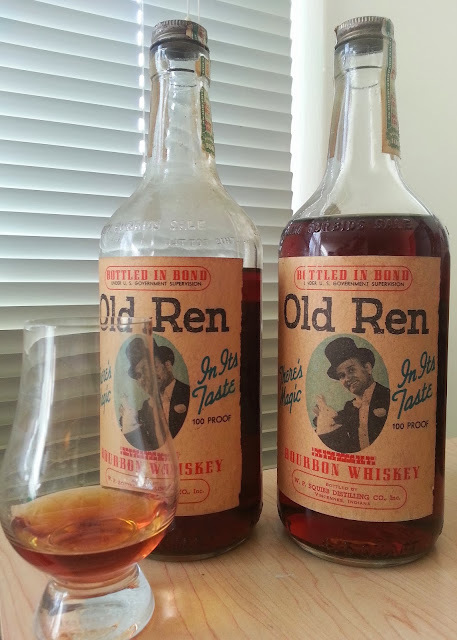 The wood management's complexity left me tasting some barrels that didn't do it for me. Color: An extraordinary light amber and rose wine pink. Salmon. Nose: Virginia tobacco again, clay, honey malt, raspberry-cherry compote in a sawn oak box. The palate is raucous and sweet. It opens with sweet cereal sugars, berry and citrus tartness, honey and red fruits and then explodes into fiery burning tobacco peat and spirit heat. The finish brings in grapefuit pith tartness and the fading prickly burn of peat redolent of potter's clay, hemp, salt air, and rock mineral. It's a classic swimmer (at 51.3% abv it fairly cries out for a drop). Water adds sweetness to the palate and honeyed richness to the mouth feel. It also amps up the fruit acids and the dynamics of almost every flavor element. Water and at least a quarter hour of water integration time are necessary for this whisky to open up and strut its stuff. It's not elegant. It's not sophisticated. Heck, it's not even balanced. It's a raging peat monster with a lovely fruity sheen added by the port cask portion of the double maturation (the remainder being bourbon barrel). Rich and big and with some lovely fruits. I slightly preferred the 2012's more floral presentation, but there's little doubt that the port wine finish's zip and tang and extra sweetness take the Laphroaig flavor signature somewhere interesting. Conclusions: young Laphroaigs are big aggressively peated flavor bombs. The quality of the peat has a clear tobacco aspect that is polarizing. I don't want it all the time - but when I do there is no substitute. What's missing in this review? Laphroaig Quarter Cask. Introduced in 2004, Quarter Cask - a NAS edition that is younger, aged in more aggressively wood infusing quarter sized casks, is the second largest selling Laphroaig expression, accounting for about 15% of total sales. I didn't taste it here because I'm not sanguine about the small cask shorter aging period idea. Maybe I'm making a mistake? If I taste it and find it to be so I'll definitely update this review. I've been taking risks lately. These include biking through urban Newark, NJ late at night to get home from a distant train station and biking in traffic in New York City. I've hit the pavement a few times (luckily without injury so far). 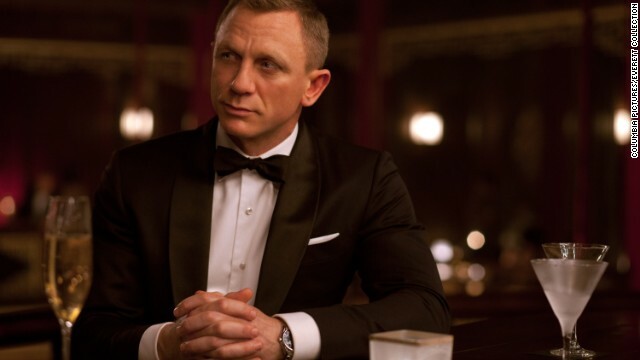 I've been taking risks in the whisky domain too - and I'm not talking about drinking a lot. 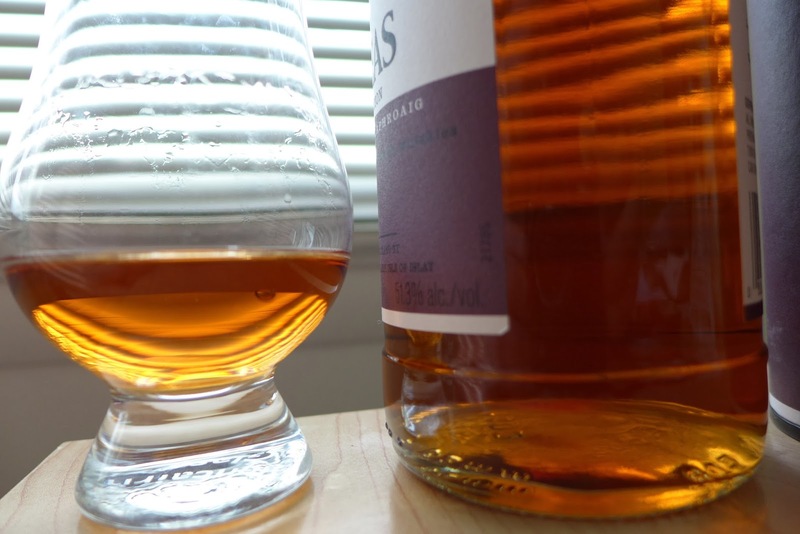 I'm talking about toying with the limits of accepted ethics for whisky bloggers. But I'm doing so for a reason - although the primary reason is "for my own amusement". But there's more to it too. 1) I wanted to see what it feels like to be on the other side of the table. Part of me thinks it might be kind of interesting from a journalistic perspective - like George Plimpton pretending to be a QB in the NFL in order to write an "insider's perspective piece. 2) I wanted to feel an "insider's" sense of belonging in the whisky community. The industry people have a tremendous esprit de corps and sense of belonging. I wanted to feel that too. Indeed, since I've poured and done events, I have been accepted by industry people to a much larger extent than I was formerly. That feels good - and it also gives me access and insight into their ways and their world. This has been fun and gratifying. It's also grist for the blog. I want to party in the scene to so I can kiss and tell. (Granted I'm way behind in telling these stories). 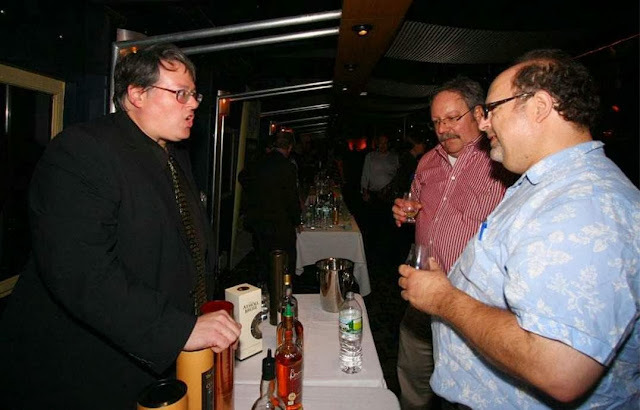 3) I really enjoy talking about whisky with people. Pouring at shows has been a blast because I get to teach people about whisky and share some of the passion from an implied position of authority (because I was the one doing the pouring). But the burning question I must address here and now is whether this stuff compromises my ethics as blogger. Will this lead me to write some puff ball reviews of the whiskies sold by the people in my #whiskyfabric? 1. I will not accept free offers that require or expect me to bend my opinion.
" I guess we all agree that bloggers should not be industry whores. But how close is too close? It seems ["Preacher'] thinks that any visible connection to the industry already compromises the writer. I would not go that far, the real issue is how you deal with it in your writing. How honest you are and how strong you are to also express criticism about products of someone you are close to. But there is also the public perception. 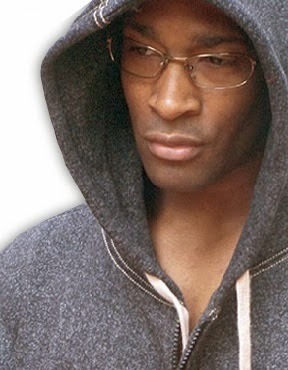 People may think you are corrupted just because you are actively endorsing a brand. It is a very fine line. And my personal opinion is that For a blogger it may be better to keep a visible distance to that line to avoid any misonterpretations. 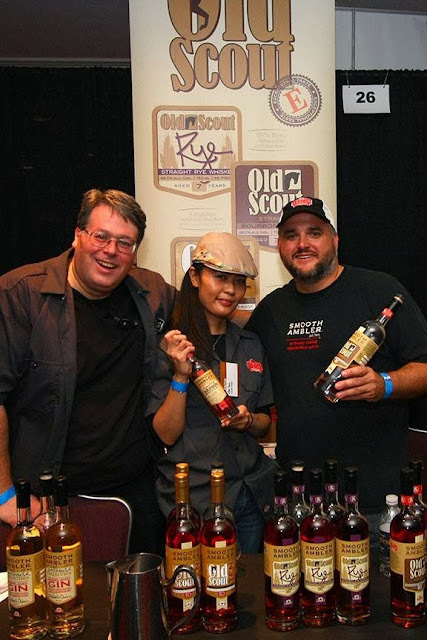 For example I would never pour for a company on a public event." 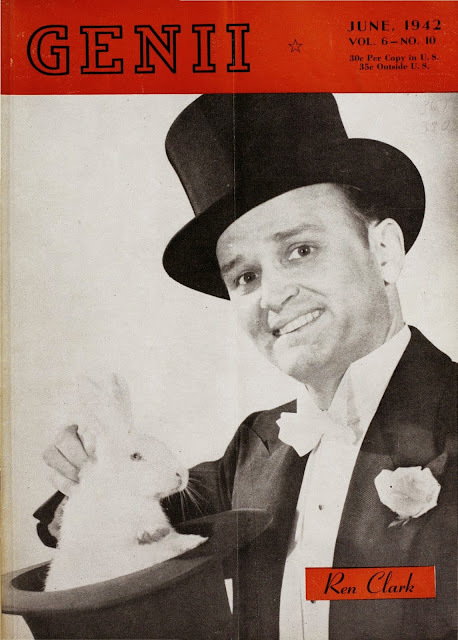 "Lifestyle journalists can’t question the industry very much because the publications they write for (mostly on a contract basis) are deeply reliant on the industry for advertising, materials etc.. Whisky journalism therefore functions mostly as a celebration of the whisky industry and everyone’s happy with the quality and quantity of reciprocal backscratching (or wanking, if you prefer). But this is precisely where I think bloggers have the opportunity to open up room for critique that the industry–the distillery owners/marketers and the major publications–cannot or will not give us; to write about issues, and from perspectives, that don’t align with those of the industry. I’m not suggesting that this is what bloggers should write about all the time–I myself spend all my time writing fussy tasting notes that a handful of people read; but keeping the theoretical space open seems important. This independence and potential critical perspective is what it seems to me gets lost very quickly when bloggers so happily jump in the pool with the professionals; and indeed many bloggers seem happy to be co-opted in this way, it seems proof of their success that the industry acknowledges and “rewards” them with access." 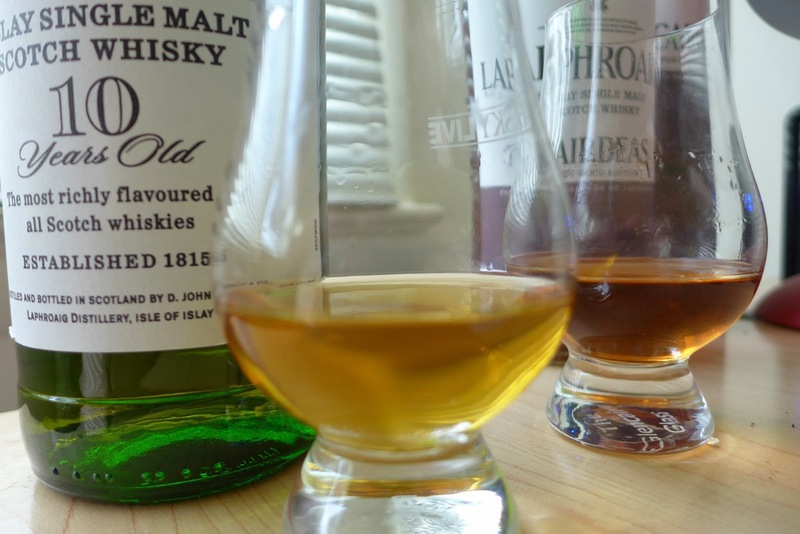 on Shane Helmick's "How to Drink Whisky" blog. Here’s the problem I as a consumer have with suspending my disbelief. I know you have a basic contract you have to sign and you’re acting as a representative for the company. No one’s going to want the brand ambassador who, as he’s pouring the mainline NAS release, says to the recipient, “This is a mess and it’s a real shame the distillery has made this their primary entry-level whisky.” Presumably, given your professed desire to stay involved in this promotional capacity, you’re going to broadly make nice. I don’t personally have a problem with it – IF THE RELATIONSHIP IS KNOWN TO THE READER. You gave Smooth Ambler’s year-old bourbon high marks, and then a few weeks later, there’s a photo of you in an Ambler shirt pouring at an event. Boy, I wish I’d known that you were cultivating or had a relationship with these guys." 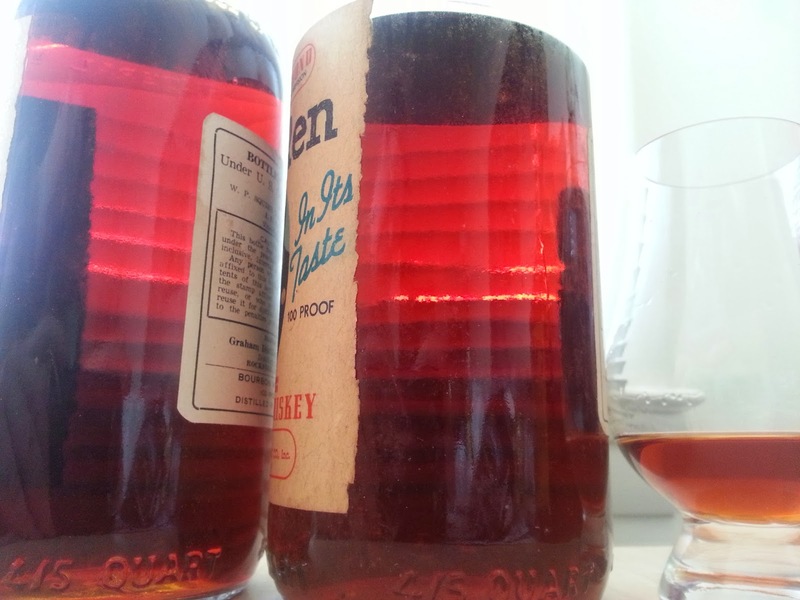 "I wrote the Smooth Ambler blog post several weeks prior to agreeing to pour for Smooth Ambler. I fully disclose my warm personal relationship with John Little in the Smooth Ambler blog post. At the time I wrote the post that’s as far as it went. If I had a pre-existing relationship with Smooth Ambler I would have divulged it. 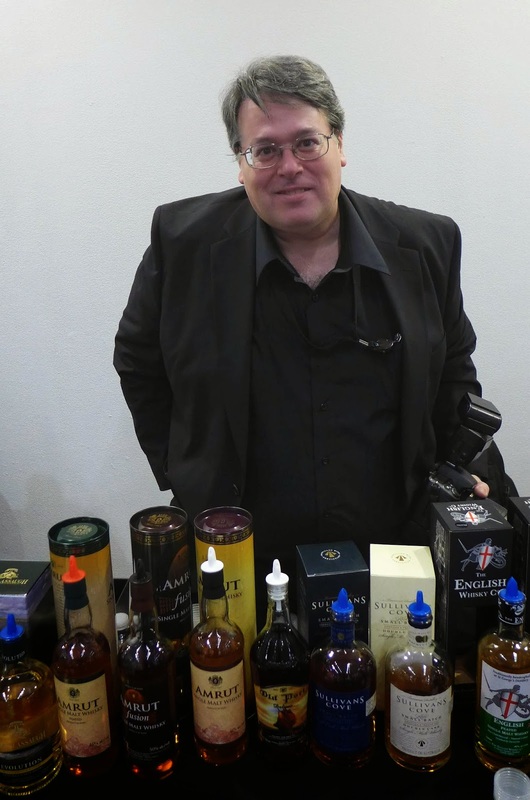 Later on, I asked John Little if needed help at Whisky Fest. He agreed to put me on the list. I poured Smooth Ambler and took a dregs bottle of Old Scout 10. Other than that dregs bottle and admission to Whisky Fest (which I saw little of, between pouring and having my sister in town) I was otherwise not compensated. When I review the Old Scout 10 I’ll divulge the source of my sample." 1) I'm going to abide by Oliver's Klimek's 6 points of whisky blogging ethics. 2) I'm going to stand up here and now and promise to myself and to you that I'm going to tell the unvarnished truth about any and every whisky I blog about. I will not soft ball whiskies I don't like just because I have a relationship with the importer, distiller, or ambassador. 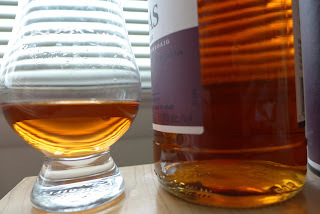 3) I'm going to review my dregs bottles and I'm going to be completely honest where the whisky came from - just as I have been very honest about the source of all the whiskies I've reviewed so far. If I've been given a sample or if I swapped for it I say so. 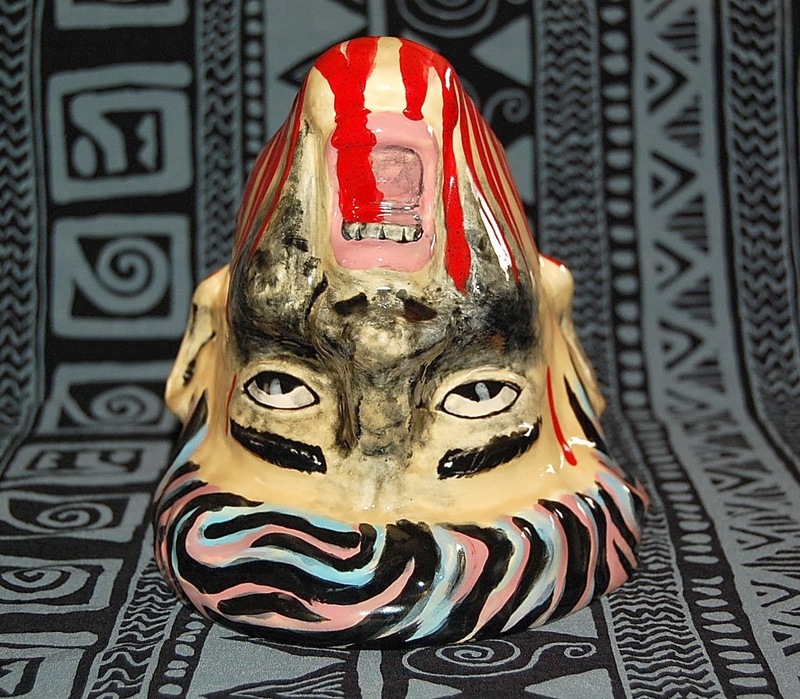 If I don't bother to say where I got it - it's because I bought it in a store. 4) If and when I pour whisky at a show and you happen to walk up to me, I'll tell you the truth about the whiskies I pour. Ask anyone who has come up to me at a show and had me pour them whisky. I tell the truth about what I'm pouring. There have been some whiskies that aren't as good as the others and I've said so. However, the rare times I pour, I pour whisky that I'm interested in because I think it's good or I think it has some redeeming feature that makes it worth trying. 4) If I have a relationship with the importer, distiller, or a brand ambassador, I will be honest and forthcoming about that fact. Look back over my reviews and you will see that this has always been the case. 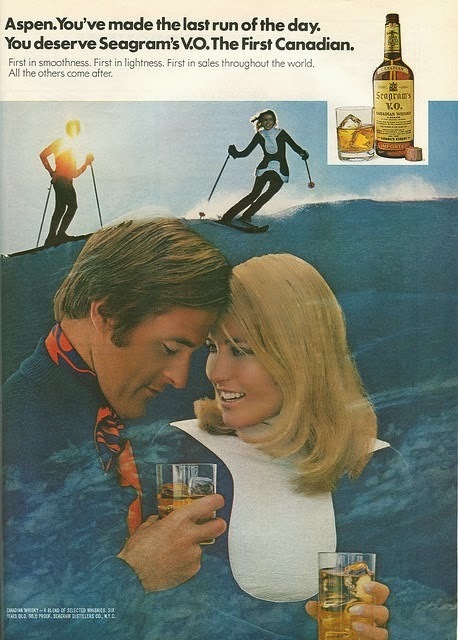 5) I will not let personal relationships interfere with my telling the truth about whisky. I'm going to post a lot of reviews in the coming months and years and I'm going to describe what's in the glass to the best of my ability in each case - no matter what my relationship to the person(s) who brought the whisky into being. 6) And, finally, I won't let any of the aforementioned get in the way of me doing whatever the ! @#$ I want to do. And if I want to hang with whisky people and maybe even pour their stuff that's what I'm going to do. If I start judging for the Malt Maniacs awards I may reconsider this position. 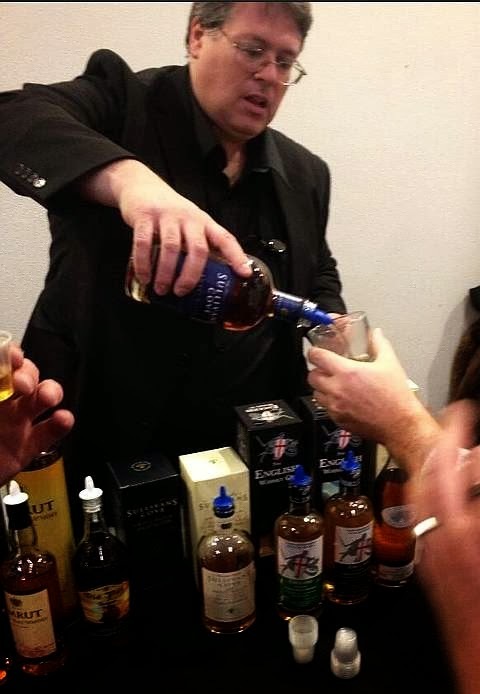 So, what's it like pouring whisky at a big event? It's loud, frenetic, often repetitive - telling the same story about what you're pouring over and over again, and involves hours standing in a way that makes your feet tired. It's also a wonderful opportunity to geek out with a huge cross section of the whisky community. 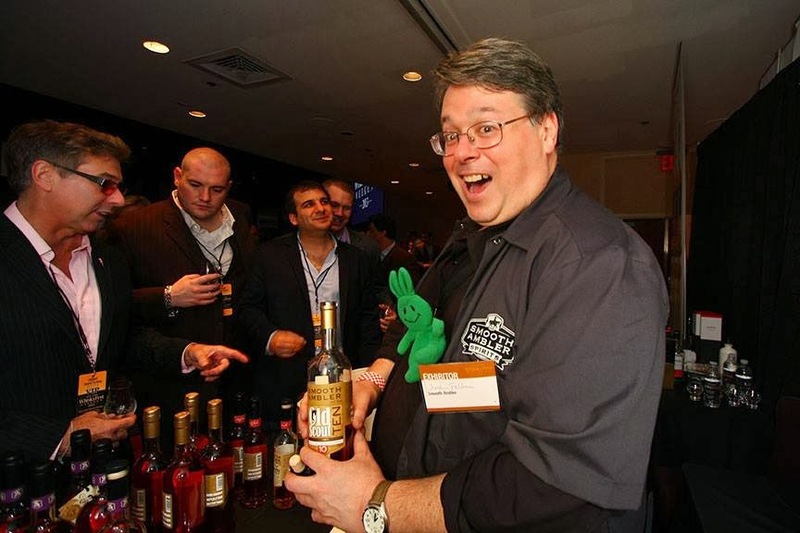 I get to meet and discuss whisky with bloggers and passionate insiders, and also beginners and partiers and sometimes obnoxious inebriated people. It's a fascinating experience being on the other side of the table. It makes you feel a kinship with the whisky that you don't normally experience. Now, the challenge will be seeing if that feeling of kinship affects my ability to write about these whiskies impartially. I say "no". Check back and find out. And don't be afraid to call me on it if I seem to be straying into "bogus".